Technology transfer programs are a key component of the United Nations Framework Convention on Climate Change (UNFCCC). With new, clean technology, developing countries can grow their economies while slowing or stopping the growth of their greenhouse gas emissions over time. The challenge is in designing and establishing programs that will be environmentally and economically effective. With government and public funding constraints globally, the UNFCCC and countries around the world recognize that public funds must “unlock” private-sector investments. Despite the fact that these technology transfer initiatives will rely heavily on the private sector for implementation, businesses are largely absent in international dialogue. Multinational corporations can add a valuable perspective to the discussion, one that could increase the likelihood that the mechanisms established will effectively spur private investment. The Institute for Building Efficiency (IBE) recently teamed with the Business Council for Sustainable Energy (BCSE) to create an issue brief on scaling up energy efficiency technology implementation within developing countries. The brief was released during the May 2010 UNFCCC meeting in Bonn, Germany, at a luncheon co-sponsored by the two organizations on the private sector’s role in the design, creation and operation of technology transfer and deployment mechanisms. This issue brief is intended to jumpstart a discussion on how to translate the theory of technology transfer into effective actions among governments, NGOs, companies, universities and the UNFCCC. It provides a toolbox of policies and actions nations can take to overcome the barriers to attracting private investment in energy efficiency projects within their borders. The technologies are available today—One of the major barriers to technology transfer for emerging clean technologies is the reluctance to share and transfer intellectual property (IP). Because energy efficiency technologies are already commercially available, the IP issues associated with technology transfer are minimal. Flexible solutions can be catered toward each project— Energy efficiency offers a broad, flexible suite of approaches and technology options. Companies and governments can implement a range of simple, relatively inexpensive measures, such as compact fluorescent lights, or opt for more complex projects that incorporate sustainability and efficiency into all new building designs. While significant barriers exist to implementing energy efficiency within developing countries, there are a number of actions governments can take to scale up efficient technologies, including the implementation of policies and standards that encourage investment, the development of training and education programs for the workforce, and the facilitation of information exchange in the market. The capacity-building toolbox below outlines an initial framework of actions these governments can take to remove significant barriers and create new market opportunities. It is important to note that the majority of innovative, successful energy efficiency projects within developing nations have occurred with significant engagement and collaboration from key stakeholders, including national and local governments, businesses, NGOs, universities and others. 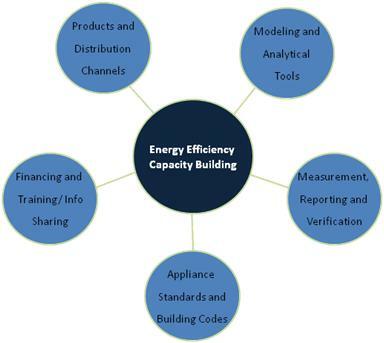 A more in-depth discussion related to this framework is included in the issue brief, “Energy Efficiency Technology Exchange and Capacity Building: A Private Sector Perspective,” Which can be downloaded in the “Resources” section above. 2 2009 World Energy Outlook. IEA.